I THINK 10 & 11 are from the 4kids vehicles, might be the Battle Shell & sewer car thingy respectively? Thanks, they both appear to belong to the Battle Shell. I'm pretty sure I already have a complete set for both my regular and SWAT Battle Shells though. Did any other vehicles come with those missiles? Also, did they make ornaments of the rest of the Turtles? Oh boy do I have a big round and this is only the tip of the iceberg and not the black/grey accessories. My boyfriend recently moved in his childhood toys and while the small figures like TMNT and Toxic Crusaders are MIA we got a box full of accessories. Other toylines he had were Masters of the Universe, Conan the Barbarian, Batman, Thundercats, Skeleton Warriors and some random WWE along with GIJoe. I started off looking up the figures we do have but they all seem to have black/grey accessories which I haven't even tried going through yet. Figured colored items would be easiest first. All the first photo items have been all identified thank you! Last edited by jazzmatazz; 05-26-2018 at 12:13 PM. The bow I believe is from the original Playmates Splinter, and the canisters are from Grease Pit's bike from Biker Mice From Mars. Thank you it's a start! 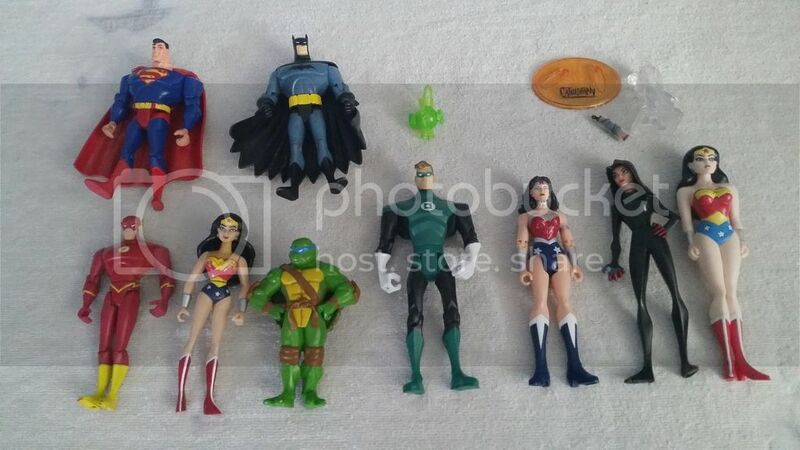 And another toy line to keep in mind when trying to id the rest of the lot. The green proton pack is Peter Venkman's, the head with an arrow through it is Harry the Huanted Hunter from Beetlejuice, the blue stick with the chain is one of Panthro's nunchucks from Thundercats and the red head-dress with horns is Mumm-Ra's, also from Thundercats. "Leave this to the real Raphael!" The orange gun in the first pic is from Make My Day Leo. The "rock and roll" and "totally awesome" flags are from Talkin' Turtles. The blue/green panel is from the Turtlecopter, I think. The blue nunchuck in the second pic is Panthro's from Thunercats. The yellow spiked ball in the third pic is from the Sewer Playset. The yellow bo/flute on the left side of the pic is from Punk Rocker Donatello. The green machine gun in the third pic is definitely TMNT, but I'm having trouble placing it. I know it came with Halfcourt but that brighter color tells me it might have been reused later. The red headpiece in the final picture belongs to Mumra from Thundercats. The orange disc/star belongs to Sewer Surfer Mike. The bright orange gun looks like a Playmates accessory, but I can't place it. Thought it might have been Toxic Crusaders but I can't find a match. The red missiles look like something from a GI Joe vehicle. Thanks everyone for the IDs and leads so far! Updating the photos now to cross out the identified items. As already ID'ed, you also have Make My Day Leo's gun, Splinter's bow and a wing rom the Turtle Copter. The mosquito guns are all from the Turtle Copter as well. -Spiked ball came with the Sewer Playset. -The green three segmented nunchuks are from Rock 'N Roll Michaelangelo. -The green tommy gun is from Sewer-Cyclin' Raph. -the green branch/snare is from a Swampthing figure. And this is just a guess, but the bronze shield looks like it could have come from a Sectaurs figure based on the color and design. -The boxing glove gun and the two spears near the bottom left are from Talkin' Raph. -the helmet is from Mummra as already pointed out. -The orange throwing star is from Mike, the sewer surfer. -The orange gun is from Pizza Tossin' Don. Thank you! I've been using your site for years as a source for IDing accessories but this lot is such a random bunch of stuff and a lot of it! Also hello fellow local! Last edited by jazzmatazz; 05-26-2018 at 08:51 AM. Have you ever seen this gun before? Came with Playmates' Earthworm Jim figure. Need some help, turtle bros. Who do these all belong to? If its not obvious, the ones on right are not from the basic turtles. They're a little thicker, more rubbery, & a darker color. Last edited by Powder; 08-23-2018 at 08:13 AM. The star looks like Merdude’s Ninja starfish but it’s not the correct color. Like it was painted. Also maybe the pick is Dirtbag’s 4-pointed pick. But again color is off. I’m not sure if variants or custom. The large orange gun is from Mike's Kowabunga Surf Buggy. The orange pick axe and dagger likely came with Turtle Troll Mike. He came with both and they were made in multiple colors. Let's start off easy. Do you guys know where these weapon racks are from?